If you’re not a work horse, or if you’re not committed to working like a dog for a while, no use reading on, because you’ll just be wasting your time. This post is for the dedicated; the 10% of people who will achieve their goals through hard work and determination. We’re going to create an amazing blog. A blog that provides power content, attracts massive traffic, is loved by search engines, and achieves your goals. If you’re brave enough, let’s proceed. Why are you creating a blog? What is your goal? Your reason can’t be wishy-washy. It has to be powerful and passionate. For instance, Neil Patel, digital marketing master, tells of Trent Hamm who experienced financial ruin. Anyone who’s ever been in a similar situation, will relate to the pain and despair he was sure to have gone through. When people go through painful situations like that, it tends to build passion in them. And so, Trent created a blog to help others who go through the same thing he experienced. It’s a powerful motivating factor. Your blog will only reach substantial heights when it’s driven by passion and a clear goal. If not, within 100 days, it will more than likely land on the dirt mound with all the other failed websites. Who will want or need what you offer? Create a blog that will speak to those people. Don’t make the mistake of wanting to attract everybody in case you can’t get enough sales from one smaller group. If you target everyone, you’ll end up targeting no one. And then, get to know your target audience well. Understand them as if they’ve merged into one person you know intimately. Only then can you truly give your target audience what they need and get them to convert in the buying stage. Technical SEO lays the foundation of traffic generation. For instance, if your blog takes long to load, it’s a problem because speed is important to users and what’s important to users is important to search engines. Users expect a blog to load within 3 seconds. If it takes longer than that, you can expect a drop in conversions, which means a drop in profit. So if yours doesn’t load fast, best you get some help to speed things up. Speed is only one example of technical SEO. Start by checking out the overall health of your blog with HubSpot’s website grader tool. You will be able to make some changes yourself if necessary, but otherwise it will be worth it to secure the services of a technical SEO pro, or have a custom website developed. If search engines don’t know about your blog or it’s content, you won’t get any traffic from searches, because your blog won’t be in the search engine’s index. As importantly, if the content on your blog doesn’t help them understand what your site’s about, or if you don’t use the right words, they won’t direct the right traffic to you. And if you don’t get the right traffic, you lose sales. Without keywords, your blog will be sluggish. With keywords, but the wrong ones, you’ll get the wrong kind of traffic. 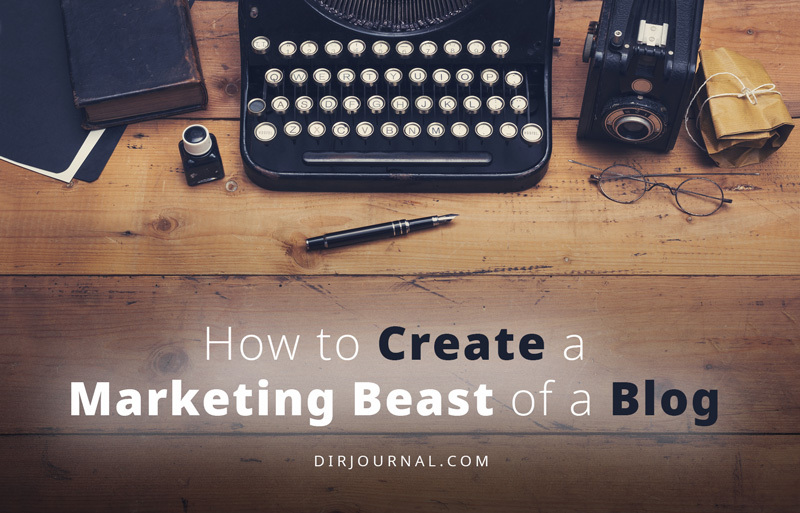 Keyword research may not be the easiest task, but it’s part of the foundation of creating a marketing beast of a blog. Backlinko explains how to do keyword research using Google’s keyword planner tool. Header tags help search engines decipher content and relevancy, so make sure to include keywords in header tags. Images play a big part in search engines’ understanding of your content. At the same time, if images are not search engine optimized, they can be downright confusing. For instance, if you upload an image to your blog and the filename of the image is “happy”, but the actual image is of a dog, and your blog post is about gardening, if you were a robot, you’d also get confused trying to decipher that! Images also do a lot to attract traffic to your site, but they shouldn’t be stock photos. Search Engine Journal gives tips on optimizing images. Make sure you compress images, so they don’t slow down your site. Getting people to buy from you online is all about trust. Gaining trust involves work, and it starts with content. Don’t make the mistake of adding content to your blog for the sake of more content. It has to provide value to your target audience. Anyway, content should be the backbone of many of your online marketing activities, and if it’s not awesome, just go home. Every page and post should boast a call to action; something you want your reader to do. It should be relevant to the content of the page. If you want your stuff to be shared – and who knows, maybe even go viral – you’ll need to make it easy for readers to do so. At the very least, add social media buttons to your blog. Only if you’re one of the top blogs in the world, can you afford to sit on your laurels and expect traffic to be led by search engines to your newly published blog posts. For the rest of us, it can take some time for search engines to cotton on to new content and add it to their index. Help search engines find your new content by locating links to it from other bigger sites. Drive traffic yourself to your new content. Simply copy and paste the link of your new post, to a few social media accounts that your target audience frequent. What makes this method work best, is to include an image that attracts eyeballs. The other aspect that makes this method work is by using an attention grabbing headline. Helps search engines find your content faster if you leave a comment on a bigger website. Can help direct traffic back to your site if your comment is compelling enough. Builds rapport with other people in your niche, and this can lead to future partnerships. Making the subject header interesting so that they want to read your email. Making the email interesting so that they will want to click through to the post. I found some unique tips by Bushra Ahzar on how to do this. Be passionate about your blogging goal. Nail the technical SEO aspects. Help search engines direct the right traffic by using keywords your audience use, adding header tags and optimizing images. Provide epic content to build trust. Add call to actions on every page. Make it easy for your readers to share your stuff. Promote new content from social media, leaving comments and sharing with your email lists.